Benford’s number law can be used to detect fraud in financial and scientific documents. Joan Smith (not her real name) was falling behind with mortgage payments and needed money fast. Working as an account controller for a large corporation, and thinking she was clever enough to get away with it, she diverted some of the company’s cash into her own purse. During a routine review, auditors noticed that the numbers in the account Joan controlled looked unusual because they broke Benford’s law. They made an appointment to see Joan and told her what they had found. It turned out Joan wasn’t as smart as she had thought. Joan confessed she had stolen money from the company. She was fired and had to pay the money back in installments. John Smith (not his real name) was a salesman for a medium sized corporation. His lifestyle required more money than he could earn legitimately and he regularly altered any expense receipts he collected which began with the number 1. He changed them so they began with a larger number – a 4 or a 7 or a 9. An $18 meal would become a $48 meal and such like. Company auditors noticed John’s receipts broke Benson’s law and called the police. 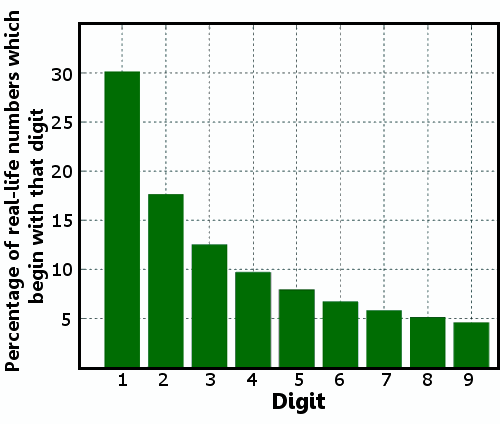 Most of us expect that in any given set of real-life numbers each of the digits 1 – 9 will have an equal likelihood of appearing as the first digit in the number. But this is not necessarily true. Whether it be in accounting or lengths of rivers, or the tallest buildings in the world, or even in scientific and mathematical constants, in many situations it is much more likely that the first digit will be a small number. This is Benford’s law. The graph below shows a typical case – almost a third of numbers occurring naturally actually begin with a one, and more than half begin with a 1, 2 or 3. Naturally occurring numbers tend to begin with low value digits rather than high value digits. How were the fraudsters caught? In both cases above the fraudsters altered sets of accounting/expense numbers so that they broke Benford’s law, which quickly raised a flag with auditors. People who manipulate data – whether it be financial or scientific – sometimes don’t realize that mathematicians and statisticians are very aware of the characteristics an honest set of data should have. Sets of numbers that look perfectly reasonable to non-statisticians will quickly raise a flag with statisticians. One of the most famous examples in science of this is Ronald Fisher’s discovery that the data generated in Gregor Mendel’s genetics experiments were 99.95% certain to have been unnaturally manipulated after the experiments were carried out. Simon Newcomb in his later years. Bentford’s law is named after physicist Frank Benford who stumbled upon it in 1938. Benford was not the first person to discover the law. In fact it was discovered in 1881 by Simon Newcomb. Newcomb was born in 1835 in Nova Scotia, Canada. He received little or no formal education and, at the age of 16, he was apprenticed to Dr. Foshay, a quack healer in New Brunswick. At the age of 18 Newcomb escaped from Dr. Foshay and left Canada for the USA. There he supported himself as a teacher in country schools while teaching himself mathematics and physics. By the time he was 21 he had become a private tutor in Washington D.C., where he used the city’s libraries to ramp up his knowledge of mathematics. Aged 22 he enrolled at Harvard University’s Lawrence Scientific School, taking only a year to graduate with a bachelor’s degree. He was appointed professor of mathematics at the United States Naval Observatory, Washington D.C. when he was 26 years old. In 1881, aged 46, Newcomb was working on astronomy calculations. In that pre-electronic calculator era he was using books of logarithms to simplify the calculations. At some point he noticed something that excited him: pages near the beginning of the logarithm books were far more worn than the other pages. What this seemed to mean – and he established the truth of the principle by further research – is that in naturally generated data more numbers begin with 1 than with any other digit. 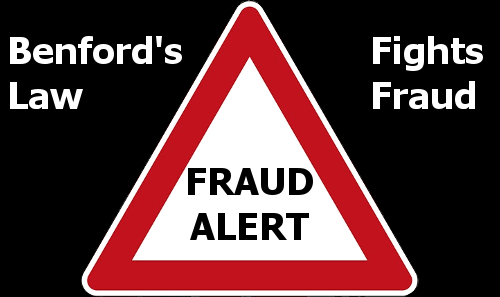 And so, to the frustration of many unwitting fraudsters, Bentford’s law was discovered.